You are currently browsing the tag archive for the ‘grandparent love’ tag. We are grandparents in crazy, wild love with our grandson. We waited a long time for him to make his appearance, and now, we are relishing every single moment of his life. 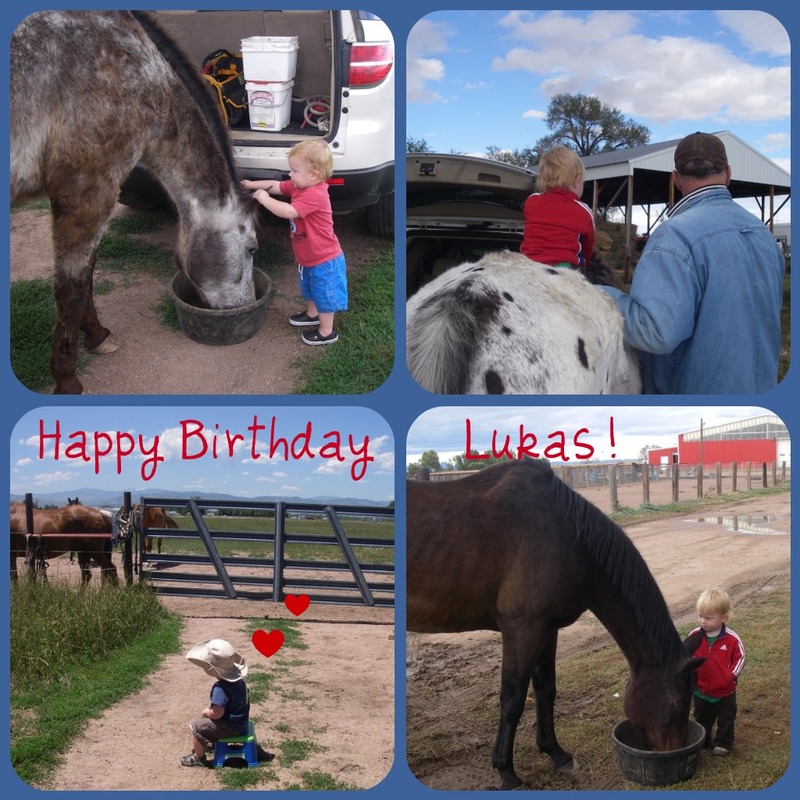 When he comes to visit us, we always make at least one trip out to see the horses. And, the photo opportunities abound. 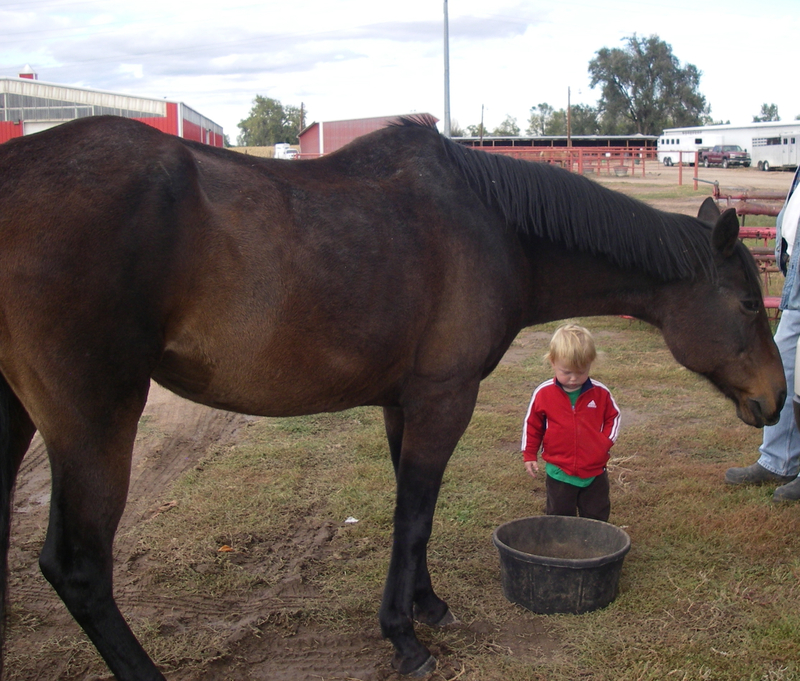 What is it about kids and animals? Some of my sweetest memories are from my childhood relationship with my grandparents. Decades later, I can conjure their voices and the luxurious feel of spending time in their presence. 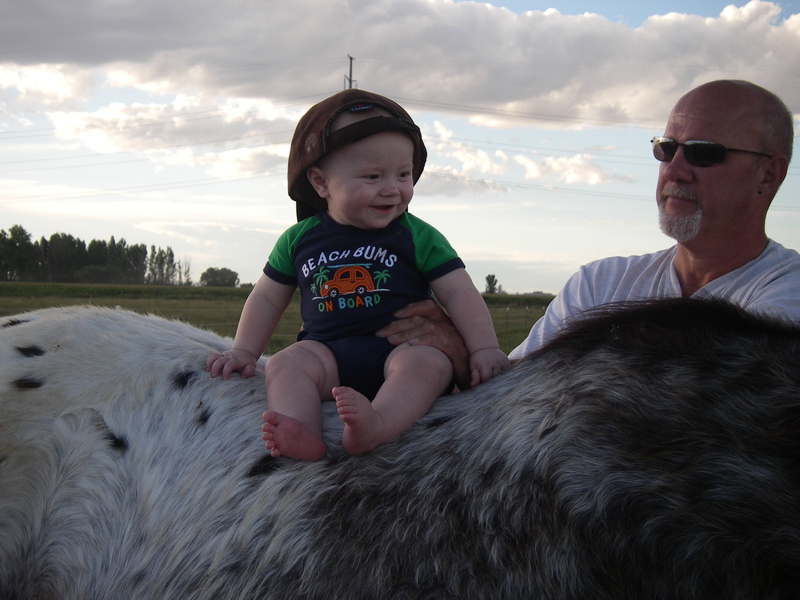 Grandparents have the amazing opportunity to be ambassadors of true unconditional love. And lucky for me, and my sisters, our grandparents were exactly that. They didn’t concern themselves with monitoring schoolwork, chores, or the specifics of our behavior, unless we broke important rules. They wisely left that to our parents. Instead, they spent their time with us dispensing love. In their eyes, we could do no wrong, and their unconditional regard washed over us in an ever-flowing waterfall. To be on the receiving end of that fountain of love was pure bliss. Today, child development experts and neuroscientists will confirm the healing, almost magical benefits of being loved so unconditionally. There were rules, boundaries and expectations to be sure. It wasn’t like some Kids Gone Wild movie. What professionals have learned is that children thrive in an atmosphere of high warmth and clearly defined expectations about behavior. Sounds like my grandparents, and I’m guessing yours too. Now the baton has been passed. My grandparents are no longer living. And my parents, who beautifully carried out the tradition of unconditional love for their grandchildren have joined them. In our little family, that leaves Rick and me to be the waterfall of unconditional love. It’s a task we’re thrilled to undertake. 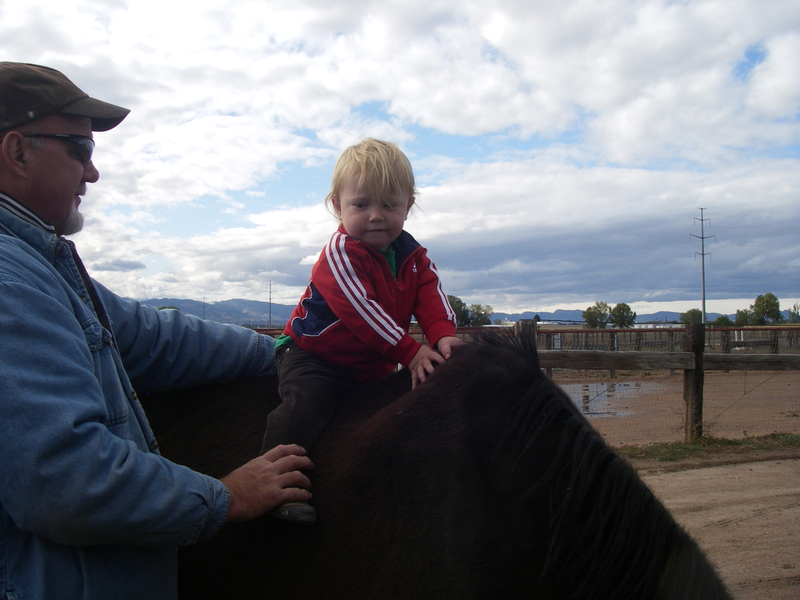 At the ripe old age of not quite two, our grandson knows the horses and has absolutely no fear around them. When he gets in our car he asks, “Horses?” He’s figured this little routine out. Has it down cold. Bud and Pepper take him in stride. This visit, Pepper even agreed to allow him to sit on her back. For Miss P. that was big! Do you have special grandparent memories? Our grandmother used to mix the last of the grape juice in the pitcher with a new can of orange juice, I presume so that she wouldn’t have to wash the container. We loved that! Thought it was a special kind of juice. My sister and I still talk about it sometimes. Just writing about it shoots me back to my grandmother’s dining nook in Kansas. I can picture the little juice glasses and nearly taste the juice. That’s how strong memory is. If you’re so inclined, tell me one of your grandparent memories in the comment section below. Could You Use a Fan Club? “Cutest baby in the world,” I said to my hairdresser the other day. I was talking about my beautiful grandbaby, a boy that has now been on the planet an entire year. I have to watch myself, so that I don’t go on and on. I do realize that others may not want to hear my stories or become a member of the same fan club. They may have their own grandbaby to gush over. Because don’t we all need a fan club? One or two or ten people who think we are just the best. Grandparents often fill that role for children. We don’t have the day-to-day concerns about raising kids. We’re not the ones to worry about sleeping through the night, potty training, teeth brushing, homework, bedtime and manners. The huge responsibility of parenting is off our shoulders. Grandparents get to do the fun stuff. And we get to be president of the fan club. We collect photos and anecdotes, marveling at each and every one. Unconditional love flows from an unending stream. And the object of our attention and affection flourishes. It’s like giving a steady dose of growth hormones. Some of my very best memories from childhood are from times spent with my grandparents. All these years later I can still picture their houses, hear their voices and remember the wonder of being with them. Somewhere in life, unless we’re a celebrity (and who can really trust that? ), the fan club goes away. We lose our raving fans – the people who think we hung the moon and can do no wrong. The people who carry our photographs and tell our stories. And smile all the while they talk about us. Well, I’d like to bring back the fan club. The ones our grandparents presided over so many years ago. This time though, we become fans for each other. I’m challenging myself, and you if you’re willing to participate, to become a raving fan of everyday people. The people in your life who make a difference but maybe don’t know that they do. This holiday season and into 2011, let’s pull out that box of unconditional acceptance, dust it off, and use it. Because really, honestly, couldn’t you use a fan or two cheering you on? Accepting you just as you are. Being the back-up generator when your own power goes on the fritz? I know I sure could. It’s official. I am crazy in love. And the cause of this crazy love? My grandson. 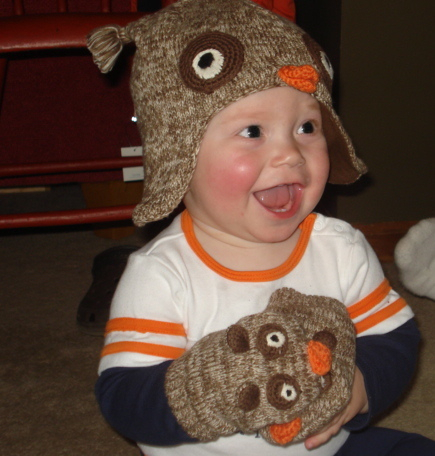 Eight months of adorableness. We’ve been deep in baby land for the past few days. It’s the reason I have dishes in my sink, a pile of laundry waiting to be washed, and no blog post written last Friday. Babies have a way of focusing a person. Baby time is different than work time. It’s even different than play time. Somehow with babies, the universe folds into itself and the passage of time becomes something entirely new. Hours take on new meaning. For that matter, so do days. If you’re smart, you sleep when the baby sleeps. And when he’s awake, you spend time with him. You play, you laugh, you cuddle, you dance. And time passes. I haven’t experienced this since my son was a baby. I’d forgotten the powerful pull of baby time. Yes, I’ve become a doting grandmother. Proud of it too! So please bear with me as I share my excitement with you. I’m warning you now that there may be more than one blog post about this most important addition to our family. As you can see from the photos, we’ve introduced the horses. 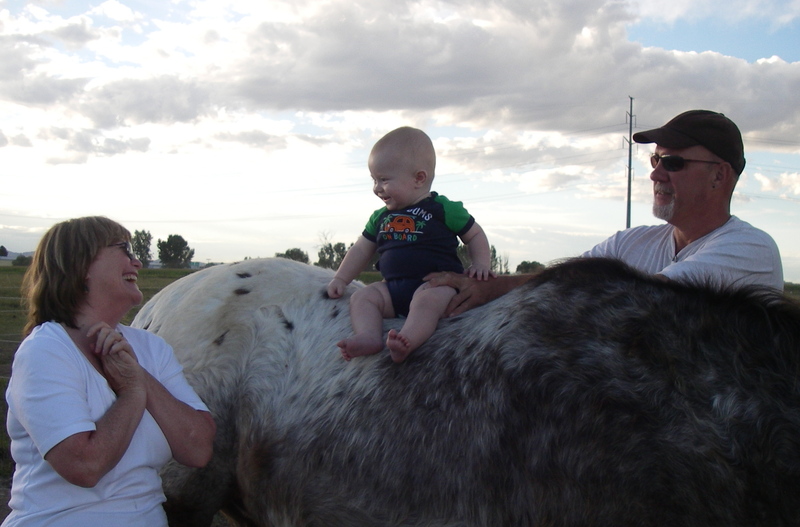 You can never start too young when it comes to loving horses. I think we’ve got a great beginning. Our little family is going home today and my life will head back toward regular time. I’ll get the dishes out of the sink, the laundry washed, and back on schedule with the blog. But I tell you this, something within me will be changed. When your heart cracks open with so much love, it never shrinks back to its original size.